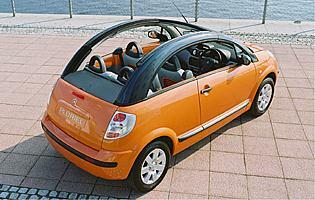 Proof that Citroen hasn't lost the knack of making innovative cars comes in the form of the C3 Pluriel. 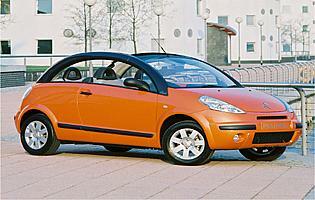 Not only a supermini but also a cabriolet, roadster and pick-up, the Pluriel is a veritable automotive Swiss army knife. However, doubts remain over its practicality when the car's talents are explored fully. A collective sigh of relief could be heard from Citroen fans when the Pluriel first appeared, as the car's arrival was proof that the French firm hadn't lost the knack of making quirky cars - only misplaced it for a while. Touting the car as one of a kind in the supermini sector is, for once, an unashamedly bold and true statement. That the car can be a sensible urban runabout one moment and a fully-fledged drop-top the next is indeed mould breaking. Owners of a weak disposition might take two or three moments to complete the transformation though, which highlights the Pluriel's main flaw: usability. As with many fashion-led consumer items, the Pluriel is not terribly practical when you make the most of its features. Sure, the car looks good, but stowing the roof and rear screen 'cassette' under the boot takes time and practice thanks to the unit's bulk and the various fiddly securing catches. The roof bars only complicate matters further. These hefty items command careful handling when being attached or removed, and require adequate storage space. 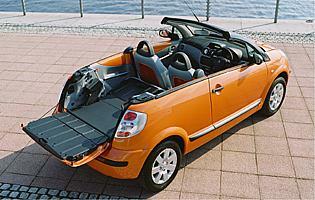 And you can't take them with you when in convertible mode, which could leave you caught out if the weather turns sour. While committed fans will merely shrug off these 'minor' inconveniences, people new to the marque may not. That said, the fiddly nature of the roof mechanism and the thorny question of what you do with the bars has done little to dent the car's popularity - if the number of Pluriels on the road is anything to go by. On paper the Pluriel is an exciting proposition as the car is well equipped and comes in a selection of bright and airy colour combinations. The reality is, sadly, somewhat different. 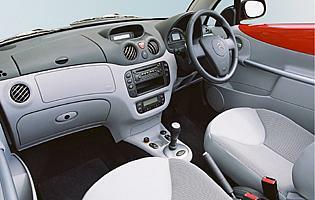 Question marks remain over the durability of the cabin, roof mechanism and the SensoDrive gearbox. The inability to stow the car's roof bars whilst on the move is big disappointment.